Organic solar cells offer lower cost materials compared to traditional inorganic solar cells. 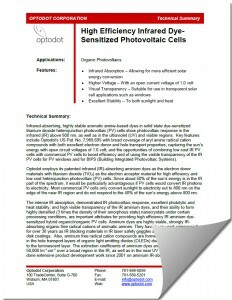 Optodot holds patents covering organic photovoltaic cells with new electron donor and hole transport materials. These materials are strongly infrared-absorbing and convert sunlight to electricity in the ultraviolet, visible, and infrared regions. To download the Optodot’s Organic Photovoltaic Technical Summary, please fill out and submit the form below, and a download button will appear under the form after successful submission. Optodot is actively looking for companies to license its organic photovoltaic technology, either as the sole material in the organic solar cell, or in combination with other photovoltaic materials.